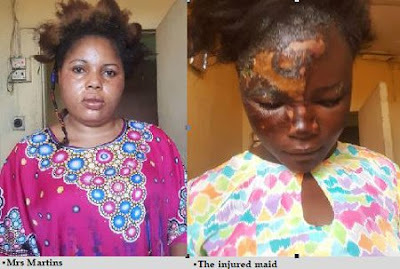 A woman, Mrs. Darasimi Martins, has been arrested by the police for allegedly assaulting her 16-year-old maid. Mrs. Martins was apprehended by policemen from Olosan Division in Mushin, Lagos, following a report by the Child Protection Network (CPN). Sources said it was not the first time the girl would be so assaulted. It was gathered that the incident occurred yesterday at 16, Olomowewe Street, Papa Ajao, Mushin. The suspect, it was gathered, sent the teenager to buy six eggs but the maid allegedly came back with four. Angered by the girl’s action, the woman allegedly poured hot water on her face and body. Neighbours reported the incident to the CPN. Police spokesman Chike Oti, a Chief Superintendent (CSP), said the case had been moved to the Gender Unit for further action.